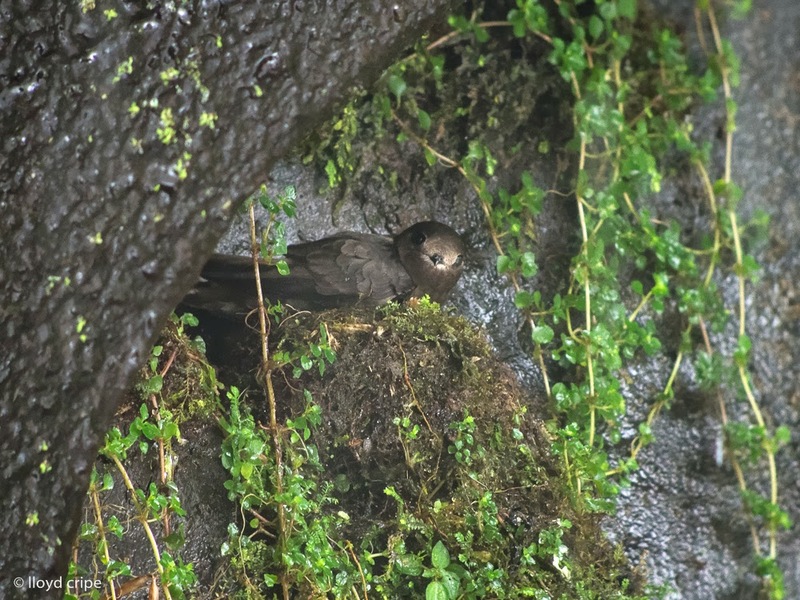 Not content with finding the first nesting records of Black Swift for Panama, Craig Bennett has now added a new species to the Panama list: Spot-fronted Swift. On May 15, while checking on the previously discovered Black (?) 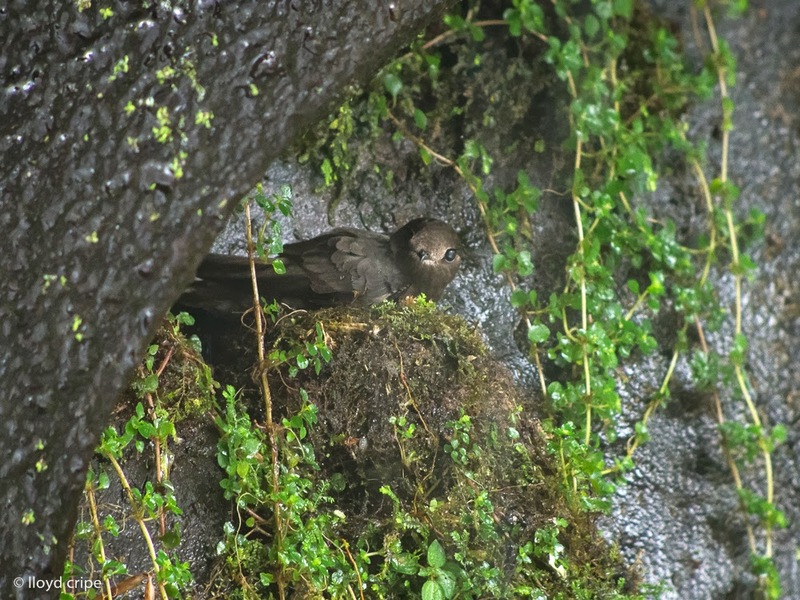 Swifts, with Dan Wade and Lloyd Cripe, that I reported earlier, I found another swift nesting behind a waterfall in the same area. This one is clearly a Spot-fronted Swift as no other swift has these bold white spots on the face. As far as I know, this bird has been reported only in Costa Rica, Colombia and Venezuela, but never in Panama. Thanks to Lloyd's talent at digiscoping we have these high quaity photos. The location is the Bajo Mono area above Boquete. Elevation is approximately 5800 feet. Attached is also a digiscoped photo of my previously reported swift. I've included it because the quality is so much better than the photo I originally provided. 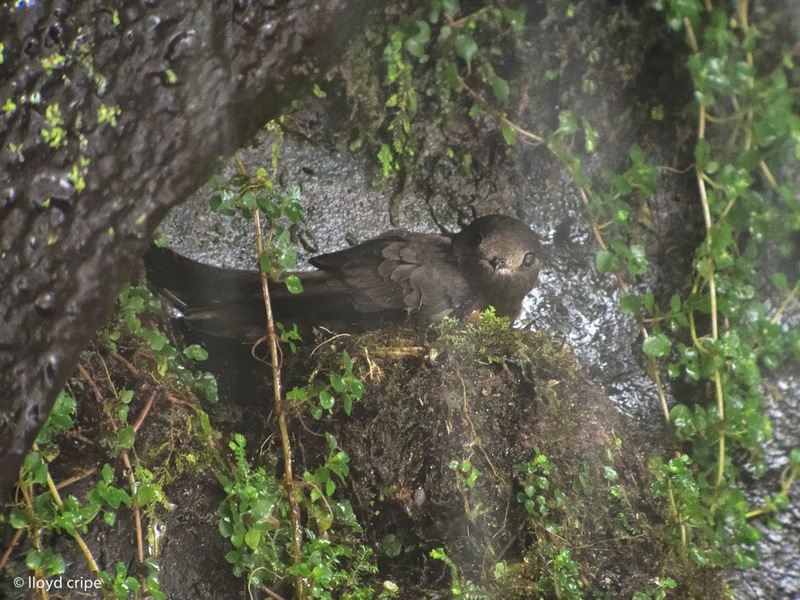 Maybe it will provide more support for the tentative Black Swift identification. 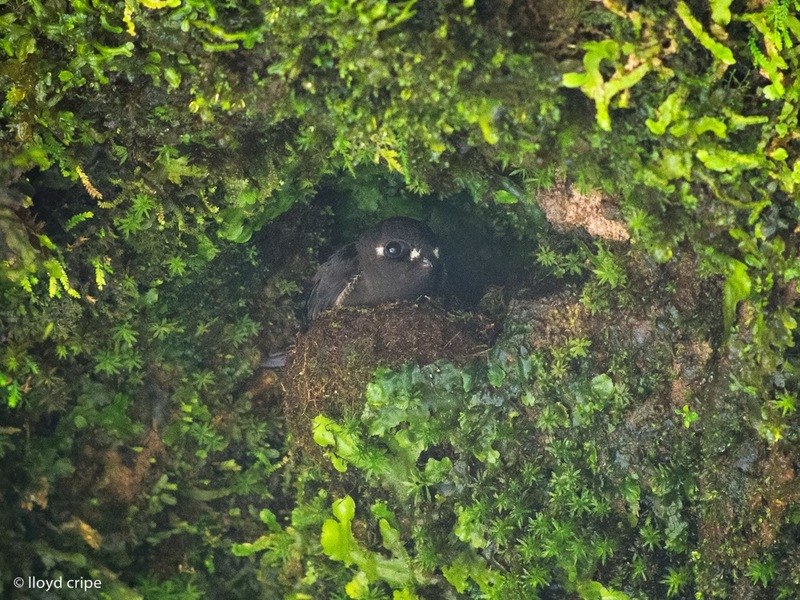 In any event, it's certain we have two unusual Cypseloides swifts nesting in the Chiriqui highlands. Very exciting!! 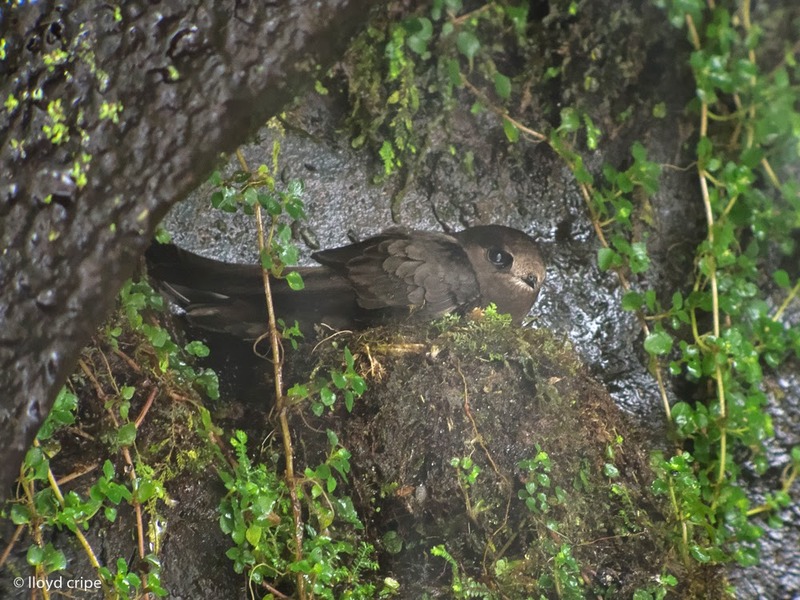 Great photos by Lloyd Cripe of the Spot-fronted Swift found by Craig Bennett!!! Congratulations to Craig on his great find!!! I have comments on the last bird, which is either C. niger or C. cryptus. The question is whether we have niger or cryptus, and we currently lack measurements. Wing and tail are the best known way to separate these taxa, with niger being larger. The face patterns of niger and cryptus have no consistent differences, but there are two other ways to separate them when they are sitting. The photo show excellent detail on the nostrils. This character is described in Marin & Stiles 1992 as a previously unknown way to visually separate cryptus and niger. Niger has larger nostrils, cryptus smaller. The bird in the photo appears to have the smaller nostrils, matching the Fig 7 in Marin & Stiles 1992. Hence, tentatively C. cryptus. The other character is the protruding rachis. The illustrations in Marin & Stiles show cryptus with fine needle-like rachis projections from each tail feather, and niger always lacks these protruding rachis (spiny tail). None of the photos we have so far are well suited to evaluate this feature. My conclusion is that we dont yet know for 100% what the 3rd photo shows, but it may well be C. cryptus because the nostrils appear small. In 2013, while leading a birding tour, I found two Cypseloides roosting on a cliff at a waterfall in the Boquete area, and these were either C. niger or C. cryptus. Craig saw these also, but we were unable to get a photo or return to the site that year. We did not contact the Panama Record Committee because we had no photo. 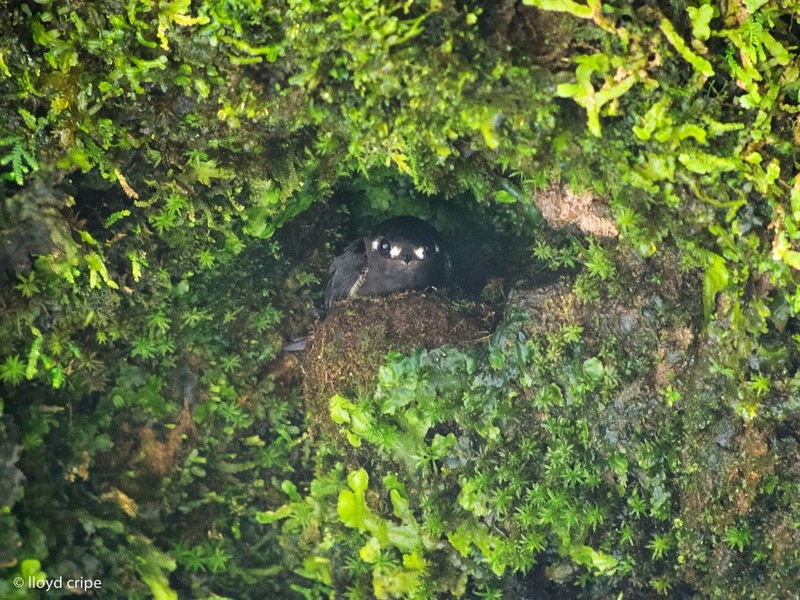 In April 2014, I led another Chiriqui tour, and had some time to search for swifts after the trip finished. Together, Craig and I began searching specifically for nesting swifts, and we now have 5 locations with nesting Cypseloides swifts. Attached below is a photo that I took on 14 April 2014. It is either niger or cryptus, and this bird went to a nest just above the photo location. This particular nest, the first one that we found, is very hard to photograph as the nest is obscured by ferns. Subsequent nests have been more open. Note we still do not yet 100% know the identity of these birds. 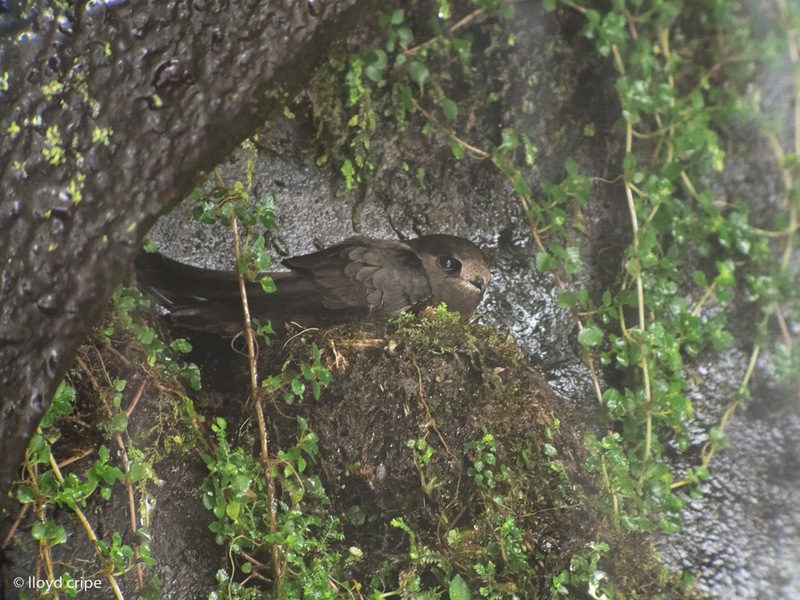 Craig and I have an on-going study of the natural history of these swifts, nesting phenology, distribution and abundance. Our intention is to publish a research article in the Cotinga or a similar journal. More observations will be made, and we will soon be able to sort out whether we have C. niger or C. cryptus, or perhaps both nesting here. Naturally Craig and I are concerned about human disturbance to the nesting swifts, and so we do not want to put the exact location out there on the internet. Thank you. I don't think there's any doubt about the Spot-fronted Swift. The photos seem to me to be diagnostic. Congratulations. I think, however, that this Black Swift photo may actually be White-chinned. One of the characters in which the two species differ in the hand is the shape and size of the nostrils, and I think your photo may show this difference. 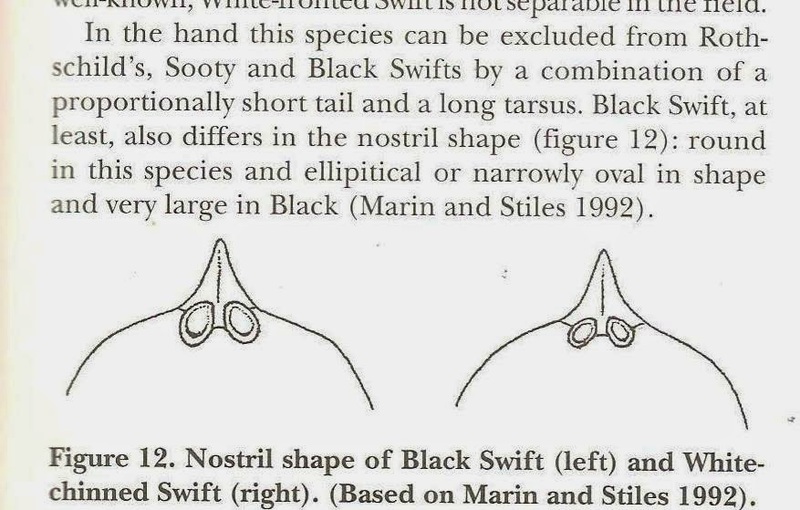 I have attached an illustration from the Chantler Swift book showing how the nostrils differ. In White-chinned they are round and comparatively small. In Black they are larger and elliptical or oval. It appears to me that the bird in your photo closely resembles the White-chinned example in nostril shape, and differs from Black. Your bird also seems to be darker on the forehead, and has an overall darker head and throat than Black. I may need to check specimens the next time I go to New York to confirm this. Thanks for some extraordinary photos. Take more pictures of nostrils! I've attached a few more photos of the mystery swift, taken by Lloyd Cripe yesterday, that may help with the nostril study. To my eye the differences in nostril shape and size are quite subtle. 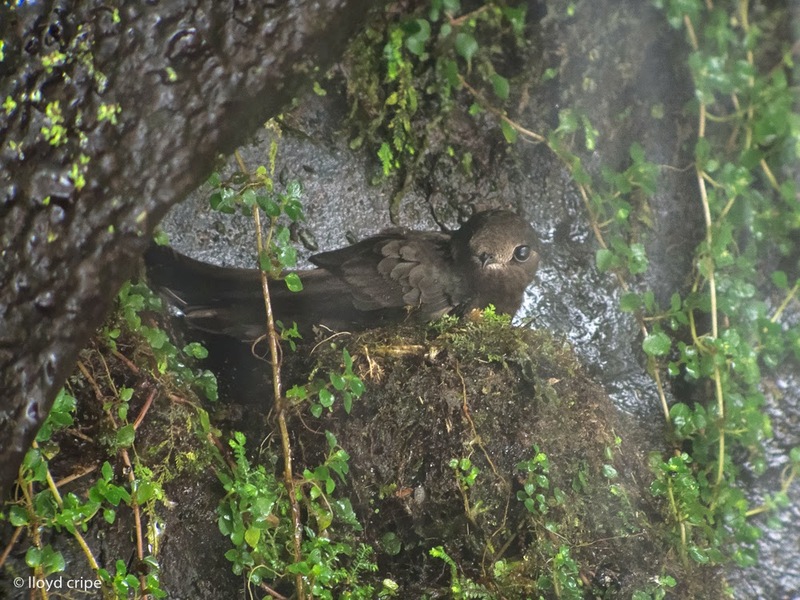 So, the jury's still out on the identity of this mystery swift. Any Cypseloides experts out there?